Champion Moonist returns, under jockey Cesar DeAlba, after winning the 2016 Los Alamitos Winter Championship(G1). LOS ALAMITOS, CA—JUNE 22, 2016—“He is a dandy,” John Cooper would often say following a win by his great trainee, Moonist. On Wednesday morning, one day after the multiple AQHA Champion Moonist was euthanized on Tuesday evening after complications from colic, both Cooper and owner Ron Hartley talked about the great, four-time champion. Cooper, however, was “still in shock” at losing the “dandy” Moonist. Cooper explained that Moonist’s conditioned worsened by the hour. Veterinarians performed emergency surgery and found bleeding in his organs. Bred by Vessels Stallion Farm, the 5-year-old Moonist was named the champion aged gelding and overall champion aged horse in 2015 and 3-year-old and champion 3-year-old gelding in 2014. He won 24 of 34 career starts and earned $878,468 while making everyone one of his starts at Los Alamitos Race Course. Sired by Separatist and out of the great broodmare Your First Moon, Moonist is one of only eight Quarter Horse to reach 12 stakes victories at Los Alamitos. He would have been the heavy favorite to add to his stakes win total when he headlined a field to the Grade 1 Vessels Maturity on Sunday, July 3. His final stakes win came on February 15 when he outdueled World Champion Heza Dasha Fire in the Grade 1 Los Alamitos Winter Championship in one of the most exciting races in the history of Los Alamitos Race Course. 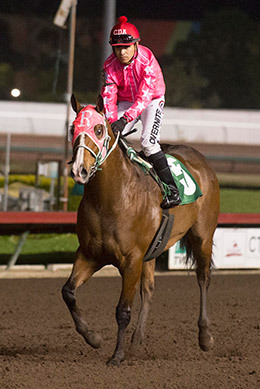 Moonist became the first horse to win four derbies in a single year at Los Alamitos in 2014 when scoring in the El Primero Del Ano Derby, Governor’s Cup Derby, Golden State Derby, and Southern California Derby. He also ran in the Los Alamitos Winter Derby and qualified to the Southern California Derby. As a 4-year-old last year, Moonist won five races including the Grade 1 Go Man Go Handicap, Grade 1 Robert L. Boniface Los Alamitos Invitational Championship, and the Restricted Grade 1 Robert L. Boniface California Breeders Championship Handicap. He ran second to Heza Dasha Fire in the Grade 1 Champion of Champions. Ed Burgart‏@qheddie Condolences to connections of champion Moonist, euthanized last night due to complications from colic. AQHA Racing ‏@AQHARacing 18m18 minutes ago AQHA Racing Retweeted Ed Burgart Heartbreaking. Peter Berry @peterberry57 2h2 hours ago Peter Berry Retweeted Ed Burgart A true legend and so much fun to watch. Rest in Peace. José A Contreras @LosPonies 2h2 hours ago Hard to put it into words what losing Moonist compares to in the Thoroughbred world. It truly is devastating news to the QH world. Teresa Del @horseychickstar 2h2 hours ago I'm so sorry to hear about moonist @cdajock my heart goes out to you & his connections ...what a fan favorite he was. Chris Wade: We lost a warrior, a workhorse. Moonist was the people's Champion who danced all the dances and always gave his all. His Heart was as big as the track and now mine’s broken. Rest in Peace big fella, we'll never forget you.